Well, this has been the craziest week! Wednesday, I got a phone call from the social worker at the hospital where Jacob has been. She informed me since we are refusing radiation for Jacob, they would be filing a petition for court. I was in shock! Well, not totally. In shock for the fact that my son in CANCER-FREE!!! Anyway, Friday morning comes and I am woke up by the sound of Child Protective Services knocking on our door. I was disgusted to find out that the hospital lied and said that he would have a 0% chance of survival if he didn’t follow through with it (that number was NEVER given to me). Second, they with-held the fact that his PET Scan came back clear and he is, in fact, cancer-free. I am disgusted by the fact that they were deceitful. What happened to parent’s rights? We are not being foolish and not taking further action with Jacob. We are taking him to a place to build up his immune system, get some healthy weight back on his bones and he will have multiple therapies to heal his worn body. The fact that they want to give him almost 2 months of radiation plus 6 months more of chemo – both of which cause cancer – when no cancer is present, is completely shocking! Please be praying for all of us! Jacob is scared and worried! He already told me that if they make him do chemo and radiation, that he will kill himself! Satan sure is working overtime, but God is in control!!! Please keep us in your prayers! I’m sure it’s only gonna get harder before it gets better. Please pray that justice will be served and that the judge will see the truth! Saturday, we didn’t do much in the morning. Quite lazy, actually! In the afternoon, we went to a retirement party for a friend of ours. The kids had a blast! It was for Jacob’s best friend’s Dad. Jacob’s friend didn’t even know we were coming, so that was a fun surprise too! We had a very good time! Well, now it’s Monday……I picked Jacob on my way into town to grocery shop. He had a blast! Didn’t want to leave, of course. He told me that it was just because he hasn’t seen all of his friends together that much since March. I can understand that. Finally on-line again! We’ve been very busy. I guess that’s a good thing since that means time is going by fast. 🙂 We ended up having a really good time at home, but of course that went by way too fast. Let’s see….Saturday, when Ken got home from work, we went to AuTrain to the beach. Had a wonderful time! It was gorgeous and it was so relaxing. Plus, the kids had a blast! Ken and Caleb got a little fried, but Jacob and I were good. Although we did spend most of our time in the cabana. Jacob had his counts checked Sunday morning. They were great! Praise God! That meant that he didn’t have to have his Neupogen shots for the rest of the week. He was so happy about that. He did really good all day, but around dinner time, he had a melt-down. I don’t know what happened, but he was not happy. He told me he wished he could fall asleep and never wake up. Boy, that is so hard to hear! I know he’s had those moments a few times already, and I can’t blame him, but it breaks my heart. I think he was just drained from a day at the beach. I’m always wiped out myself the day after too. Anyway, he woke up Monday morning and had done a 180. He was back to his old silly self. When Ken got home from work Monday, he took Jacob out on the ATV and they did a little riding. Jacob had never gone before out on the trails, but had a blast! He told Ken that he can’t wait to get his own someday. 🙂 On their ride, they stopped by Jacob’s friend Evan’s house. He invited him to come to the fireworks with us. His Dad dropped him off around dinner time and Jacob is on cloud 9 when his friends are around. We headed down towards Trenary and stopped and did a little fishing on the way. The boys had a great time and all 3 of them caught at least 2 fish each. Not keepers, of course. The fireworks were wonderful! We always love them. Jacob and Evan’s friend Dawson ended up coming, so they all had fun running around before the fireworks started. Tuesday…..the dreaded day!!! No one likes leaving day. Ken had to work, of course, but we decided to head back down to Trenary -where Ken was working to surprise him. It was a very nice good-bye, but it stinks! 🙁 The trip went great. The boys behaved and it went by fairly fast. Today we had to be in Grand Rapids by 8:00. Jacob had his PET Scan done along with a CT Scan (which I was not aware of). Anyway, everything went well. Jacob did good! We were told that they could have the results back as early as tomorrow. I’m praying so hard for clear scans! 🙂 The rest of the day was a lazy one. I didn’t get much sleep last night, so I ended up falling asleep in the hammock. It was very relaxing. My brother Neil, wife Kristina and nephew Brady came over for dinner. Nice to visit with them. Tomorrow we’ll have to leave by 9:30 for Grand Rapids. Jacob needs to get his blood counts checked again and an exam with the doctor. Friday, we’ll have to leave by 5:45 (yuck!) in the morning to head back to Grand Rapids for Jacob to have an MRI and bone scan. I think we’ll head back home on Saturday for the week before we have to be back down here. Can’t wait to see Ken and be home! I just love being there so much!!! Please continue to pray for Jacob’s healing. Please pray that his scans come back clear. We are so thankful for all of your prayers and messages. They are uplifting and we know the prayers are working. God is so good and we know that he has big plans for Jacob. I’m so thankful for everything that he’s done in our lives and what’s ahead. He has our best interests in mind, so we’re putting all of our trust in Him. P.S. Happy Birthday Dad! We love you! Not too much has happened in the last few days. Jacob has been doing VERY well! Thank you Jesus! He has not been sick at all!!! It is amazing. Truly our prayers have been answered. We are so thankful! God never ceases to amaze us. This chemo has bothered him and made him sick since day one. He did so good all last week of treatment. Amazing! Saturday, we didn’t do a whole lot. I guess I was still expecting him to start feeling sick at some point. His cousins came over and it was a beautiful day, so they just played and had a good time. Today, not the best day, but still okay. We woke up with it being kinda gloomy outside. It seemed to set the mood for all of us the rest of the day. The kids had a really hard time getting along and I was crabby. Was it from the kids arguing or was I just crabby in the first place? I don’t know. All I know is that the 3 of us were all feeling it. I think just being away from home and this whole ordeal is just getting to us or at least it seemed to be today. Well, thankfully the sun came out later this afternoon. It seemed to help out our moods too. Thank you Jesus! 🙂 I’m trying to find the good in all the bad – there’s always something to be thankful for. It can always be worse!!! Plus, talking to Ken always (or usually – ha!) makes me happy, so thankfully he called a couple times. Hopefully tomorrow will be a better day. Please continue to pray for all of us. We could certainly use it. I would of thought that things would get easier, but it’s not. Harder every day. Please continue to pray for Jacob’s healing. Pray that he will continue to have minimum or preferably no side effects. We are so thankful for all the prayers! We can’t thank you enough!!! Not a whole lot to write today. Jacob had chemo today at 9:00 and 10:00. Afterwards, they gave him a blood transfusion. Not that he needed one, but they just did it as a precaution. Knowing that his counts would go down even more over the next several days. It was a really good day though. Our friends Carisa, Lindsay and Sam showed up at about 10:00. It was so good seeing them. They were able to stay for the whole day until we left the hospital. It’s amazing how fast the day goes by when you have friends to talk to, instead of being bored out of my mind sitting in a hospital room with Jacob zoning in front of the t.v.. Well, around 11:00, my sister Liz showed up and stayed for a couple hours. It was so nice having company. I loved it! Jacob was in pretty good spirits all day. Being somewhat silly! Certainly not the kid that he normally is on the last day of a 5-day run of chemo. Unbelievable! He never got sick once. He looked pretty tired, but didn’t get sick. I couldn’t believe it! I mean, I did a lot of praying this week that he wouldn’t be, but wow! I really don’t know why I’m surprised! God is good! Oh, and I’m sure a lot of you prayed too, so thank you! We left the hospital around 6:00 and headed back to Rachel’s. It was so good seeing Caleb. Just wish we were with Ken. That won’t be for a couple more weeks though, since Jacob will have his scans and we’ll have to wait until they’re over. Hopefully time will go by fast. 🙂 We miss him so much!!! Anyway, Jacob ate dinner and felt fine. The boys headed outside to play “super heroes” and I told him to not overdo it cuz I didn’t want him to get sick. He said “Mom, I feel great!”. I don’t know why I was worrying, God is in control! Please continue to keep us in your prayers! We still have a long road ahead of us and nothing works like the power of prayer!!! It’s hard to believe that 3 months ago today, Jacob and I were flown down to DeVos. It’s crazy to think about. It feels like we’ve been gone for so long, yet we’re really not that far into this journey with cancer. Yesterday was a rough day! Not for Jacob, but for me. I don’t know what the deal was, I was just very emotional. I think I cried more yesterday than I have over the last few months. I did have somewhat of a disagreement with Jacob’s doctor and that got me started. Plus, I haven’t really been sleeping well and I’ve been under some stress about decisions coming up so I’m sure that didn’t help. Man, by the end of the day, I was so tired mentally and physically. I was completely drained and my eyes ached. I was in the elevator on my way back up from downstairs and I was doing everything to hold back the tears AGAIN (without knowing why), and I was thinking how tired and exhausted I was. How I just felt like I couldn’t do this anymore. All I could think about and picture in my mind was “Footprints”. Ya know the one where there’s 2 sets of footprints in the sand and God said “where there was only 1 set is where I carried you”. I was picturing Him carrying me. Giving myself to God. Not holding anything back. Let Him take complete and full control. I thought I had been doing that until yesterday. I realized I had been letting Him have some control, but not all. The ironic part was that my daily devotion was about living a consecrated life that is fully dedicated and sold out to God. Trusting Him completely. Wow! What a wake up call!!! Back to Jacob…..so he had a good day. He felt good and even got out of bed and went to the play room for the second day in a row. Usually that’s a Monday and Tuesday thing, but not usually a Wednesday thing. By then he’s feeling run down and just flat out crummy. Surprisingly, he was still in pretty good spirits! Today was a much better day – for both of us. First, my Dad came by this morning for a surprise visit. That just made my day! He was in town for work and decided to stop by. It was only for about an hour, but I’m so glad he did. Especially after yesterday. Jacob was in a pretty up-beat mood all day. More than usual. Maybe because when he woke up Grandpa was here. I’m not sure, but it was so nice to see. He had chemo at 12:00 and 1:00. My sister Liz, her kids Brooke, Abbie and Jared stopped by and brought my sweet Caleb with them. I was so excited to see him. I hadn’t seen him since Monday morning. Boy I missed that little guy! It was so nice to smooch on him. 🙂 They were able to stay for a couple hours and good to have more company. Sure makes these horrible days at the hospital a tad bit sweeter. Jacob’s still doing really well. Still feels great and no sign of nausea yet. Praise the Lord! I am so thankful and I keep thanking Him! I also keep praying that he won’t have any side effects. I have to remember that God is bigger and greater than all of this! Well, Jacob will be having his PET Scan on July 6th and MRI and bone scan on July 8th. We are very anxious to hear the results. Please be praying for Jacob and for Ken and I as we go into the next phase. We have decisions to make and that’s been a little stressful too. We just want to make sure we’re doing what God wants – what’s best for Jacob. “Ironically”, my devotion for today was about wanting to know God’s will. It said to be thankful – all the time, no matter what you go through. Keep a grateful heart in every circumstance and it will open the way for clearer direction in all other things. Again, WOW!! Obviously God is listening and put those devotions there for a reason. Words I needed to hear at this moment. And with that being said, I am thankful! Thankful for a wonderful, loving husband. Thankful for two beautiful, sweet boys. Thankful for my caring family and friends – old and new. 🙂 And so very thankful for all of your thoughtfulness, encouraging words and especially your prayers. The power of prayer is amazing and that has been proven over and over again in the last few months. God is certainly amazing!!! Thursday, nothing too exciting! But when we’re home, that’s ok with me. The boys friends left after spending the night, so it was just kind of a mellow day. Ken had to work, so I just got some projects done around the house while the boys lounged. We had a heated game of Monopoly (the boys favorite game at the moment) and then off to bed. When I put Jacob to bed, I noticed his forehead was warm. I took his temp and he had a fever of 100.3. That had me nervous, because it’s a very big deal to watch the temp while on chemo. We’re supposed to call if it’s 101 or higher. Unfortunately I didn’t sleep that well that night – worrying if he was ok, but got up a few hours later and he was back to normal. Friday, Jacob had to go in AGAIN to get his blood counts checked. Ugh! They must think we have nothing better to do than to run to Marquette every other day. Believe me, when we finally make it home, that’s the last thing I want to do – to hop in the car again. Anyway, we did that in the morning. Got the phone call in the afternoon about his counts – they were in the hole! Horrible! But, as we’ve learned in the past, nothing is impossible with God! They wanted us to go back in Sunday morning before we headed back down or stop at a clinic on the way. Ummm…..I don’t think so! They wanted Jacob back in on Monday morning no matter what, so what was the point? I declined! Anyway, they did insist on light activity and to stay away from big crowds. Well, I have a wonderful friend Michelle, who offered to watch the boys so Ken and I could go out on a date. I was hesitant at first with his counts being so low, but decided that we really could use that time alone. So, we dropped the boys off and headed out to dinner. It wasn’t anything fancy or a late evening, but a very nice one at that. So nice to have good conversation without being interrupted. We needed that!!! Saturday was just a wonderful morning to sleep in! Just a lazy day – loved it!!! We celebrated Father’s Day early since we had to leave Sunday. 🙁 We then talked Jacob into going for a short bike ride. He was so nervous. That was the first time he’s been on a bike since last fall. He was so nervous that he would get hurt since his balance is a little off. I knew that riding a bike for him would be much easier than walking. Sure enough, he did great! And he had fun too. We all did. When we got back, we played a few games of basketball and then switched to baseball. Jacob was starting to get tired by then, so he did all the batting and I ran the bases. We were on a team and Ken and Caleb on a team. And might I add, we won! 🙂 Boy, was I pooped at the end. After all this sitting around in the hospital for the past few months, that tired me right out! Well, Sunday finally came. The dreaded day! How does 10 days go by so fast? We left close to noon. It’s always such a horrible time – so emotional! Everyone’s upset and it just keeps getting harder every time we have to leave Ken. What a Father’s Day for Ken! At least we celebrated it a day early and at least we didn’t have to leave first thing in the morning. (I had to find the positive in there somewhere!). I prayed that we would have a quick trip. It is so long and I’m sick of driving it already, but always worth it. Anyways, it did go by pretty fast. The boys did good. Caleb did ask several times how much further. I think he asked me 3 times in like 10 or 15 minutes. Seriously??? God answered my prayer! Somehow we made it in 7 hours. We even made a couple stops and had to drive behind several drivers going WAY below the speed limit for the last hour of the trip. Not to mention all the people creepin along US-2. When we got to my sister Rachel’s house, my Mom and Dad were there along with my sister Liz and her family and my brother Neil and his family. It was so nice visiting with everyone and especially seeing my Daddy on Father’s Day. 🙂 It took some of the sting out of having to leave Ken. Well, Monday came and Jacob and I were off first thing this morning to come back to the hospital. They checked his counts and they were good. His hemoglobin was still low, so they got us in a room fairly quick and gave him a transfusion. 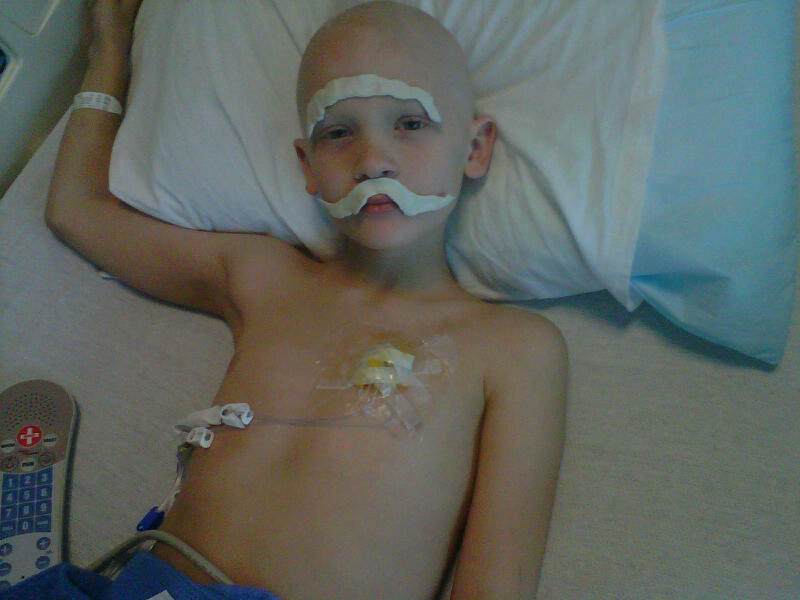 They had to wait until he was fully hydrated before they could start chemo tonight which was about 9:00. We’re in for 5 days this week for Ifosfamide and Etoposide. He does fairly well with this round until later in the week when it’ll finally hit him. Thank goodness he’s in good spirits so far! Hopefully that doesn’t change. By the way, his weight has held study over the last couple of weeks, so I’m very thankful for that.